Office space needs to portray a certain level of professionalism. It needs to be kept clutter-free and well-organized. 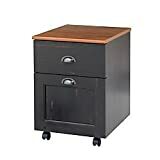 One must-have office furniture that takes care of this is a storage cabinet. From vertical, flat to mobile cabinets, there’s a whole avenue of options for keeping your important files safe and within easy access. Sometimes, office space can be too tight to accommodate these types of storage cabinets. This is where lateral file cabinets come in handy. The low-profile design does much to save space and allow the cabinet to be accessed even in a seated position. Choosing the best lateral file cabinets can be quite tricky if you don’t know what to look for. To stay on the safe side, ask yourself these questions. Is the cabinet made of a durable, solid material? What type and sizes of files are it designed to accommodate? Does it have a lockable feature to keep your files safe? As you can see, there’s a whole lot of factors to consider. So why not save you the trouble? 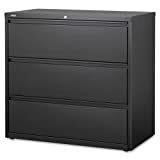 Below is a list of the best lateral file cabinets you might want to consider. The black finish and black accents of this lateral file cabinet will surely lend an air of sophistication to your office space. It’s a solid cabinet fabricated from wood to provide a construction that’s sure to last. The cabinet has 2 drawers with the top drawer sporting a lockable feature for maximum security. The drawers are spacious enough to accommodate legal size letters and documents. 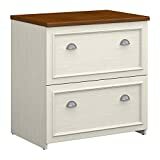 Fitted with heavy-duty glides, the drawers pull out almost effortlessly. Metal glides come in handy to give you an easy time during filing. Add a warm feel to your space with this lateral cabinet. The cabinet sports an espresso finish providing the natural look and feel of wood. 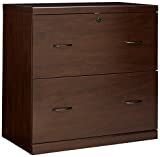 There are 2 drawers for storage. The top drawer has a lock to ensure that your files and documents are secure. With plenty of storage space, you won’t have trouble storing legal size files and documents. Metal rails are fitted in the drawers for easy filing. The drawers have metal glides that let them pull out effortlessly and quietly. Though you get to dig a little bit deeper in your pocket, this lateral file cabinet is definitely worth it. A versatile look sporting a touch of vintage and classic styling ensures that the cabinet blends in well with any decor. It’s more like a cross between the old and new world. The cabinet has 2 locking drawers designed to fit documents of all sizes. You get the convenience of ball bearings for maximum support and smooth operation. The cabinet comes fully assembled and looks solid in every way. The design of this cabinet screams sleek and compact. You get spacious storage provided by three drawers. Each drawer has hang rails that make it easier to file legal sized files and documents. The cabinet is equipped with an interlock system to ensure only one drawer is opened at a time. You get removable locks for maximum security and a ball-bearing slide that prolongs the life of your cabinet. Levellers are fitted at the base to keep the cabinet stable on uneven surfaces. The levellers combine with counterweights to eliminate the risk of tipping. This antique cabinet has a hand-carved look accented in bold modern colours; a versatile design that combines the best of the old and new world. The cabinet is fabricated from engineered wood to provide a storage solution that can withstand the test of time. The top drawer is designed for file storage while the bottom, larger drawer comes in handy to accommodate your supplies. This cabinet is a storage solution on wheels, a feature that makes it portable and easier to move around. With this lateral file cabinet, you will surely quench your thirst for an elegant and durable storage solution. It’s a perfect blend of traditional European styling and modern outlook. The cabinet sports multiple finishes and metallic accents that will make you feel attached. It’s designed to be heavy and extremely solid to last a lifetime. The cabinet has plenty of storage provided by four drawers. Two drawers have a lock for added security. This cabinet has an authentic, updated look that combines modern functionality and effortless beauty. 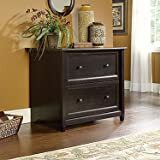 This transitional style cabinet has two drawers that hold legal-size or letter-size files. You get to access one drawer at a time, thanks to an advanced interlock feature. The cabinet is fabricated from composite wood optimized for durability. It comes in a black finish that sits well with virtually any decor. Coming in an antique white finish, this lateral cabinet file won’t fail to impress. It’s a great match for different office decor and has a durable construction that you can rely on. There are two drawers fitted with ball-bearing slides for easy and quick access. The drawers can hold letter or legal size files without a hitch. This cabinet pairs well with L-shaped corner desks to provide an extended work surface. 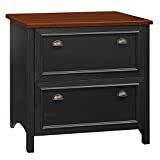 This is a dark grey cabinet sporting a warm, cherry top. It’s a two-drawer cabinet designed to accommodate legal-size files. Accented with antique hardware and bright speckles, this cabinet is sure to make a statement. Behind the beautiful look is a functional storage solution fitted with ball-bearing glides to ensure it lasts for longer. The cabinet is compatible with a computer desk placed side-by-side for an expanded working surface. 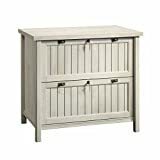 This cabinet sports a design that’s influenced by cottage coastal styling. It’s a real beauty featuring beadboard panels, drawer fronts, and framed doors. The cabinet is fabricated from a compressed board with the exception of the legs that come in solid wood. It feels solid and heavy, which makes tipping quite impossible. The cabinet provides the convenience of smooth drawer movements. 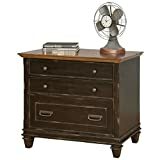 The drawers are large and come with locks to keep your documents secure.